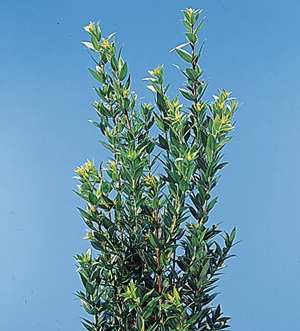 As a member of the Myrtaceae (myrtle family), its common relatives include Eucalyptus, Leptospermum and Melaleuca. Glossy pointed leaves occur along woody stems, regular and dwarf forms are found in the trade. Stems woody, 12 inches long for dwarf types, up to 4 feet long for regular types. Leaves have sweet, spicy, orange scent, flowers also fragrant. 36-41 F, for up to 5 days in water. Named for Myrrha, a favorite priestess of Venus. When pursued by too ardent a suitor, Venus turned Myrrha into this fragrant evergreen shrub to preserve her. The specific epithet name communis means growing in the same community. Venus wore a myrtle wreath when Paris awarded her the Golden Apple for beauty. Myrtle is often used in wedding arrangements, representing Venus and love. According to Arabian legend, Adam gave a sprig of myrtle to Eve when he declared his love for her. An infusion of the leaves makes a powerful antiseptic and astringent.